How often do you munch on a giant bowl of RAW veggies? Probably not that often, don’t worry– neither do I. Don’t get me wrong I love a good salad, but sometimes I’m just not in the mood! But don’t worry my friends, there are many ways to eat RAW that don’t include salads. Why is eating RAW foods important? Incorporating RAW veggies into your diet is a great way to increase the benefits of eating vegetables in general. When we cook our veggies a lot of vitamins and nutrients are lost in the process. Consuming foods that have not been heated about 130 F, we are eating enzymes that are still living within the plants. Living enzymes are proteins that serve as a catalyst for many many many functions in our body. Think digestion, metabolism, brain waves/activity, immune-system functioning, energy production, repairing RNA and DNA and they also speed up detoxification and weight-loss. NBD. 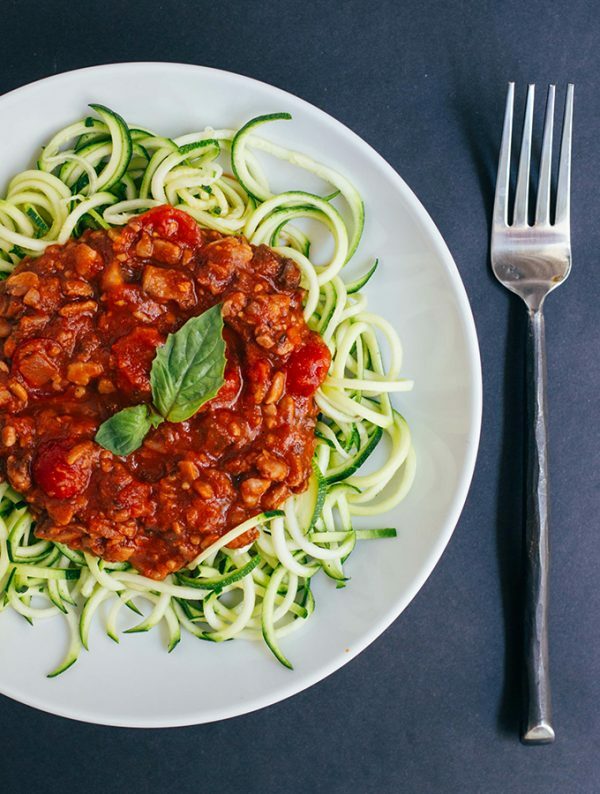 This meal isn’t completely RAW- so it’s a good introduction for your taste buds. 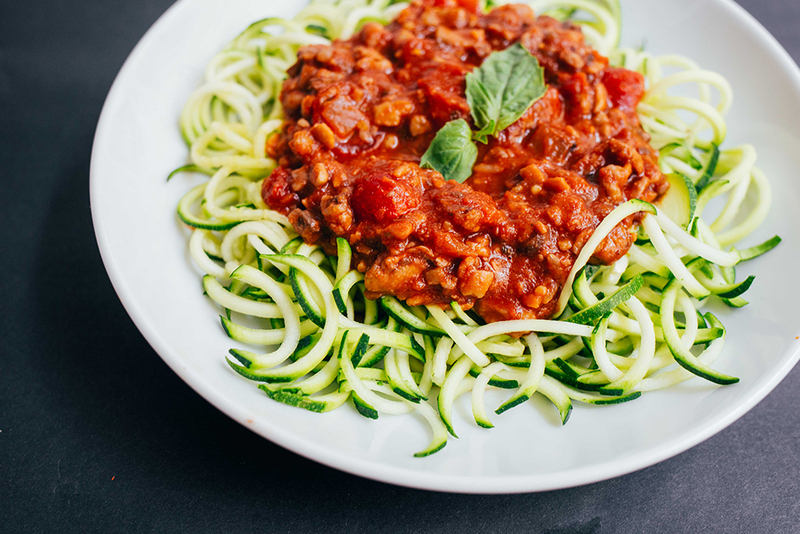 It incorporates a bunch of RAW zucchini, tomatoes and fresh basil with the sauce that is made of a mix of TMW crumbles and marinara. 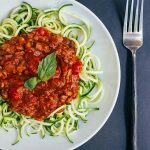 The texture and flavor of the zoodle noodles is amazing- I honestly prefer them to regular pasta now- and I’m a pasta lover! Enjoy! 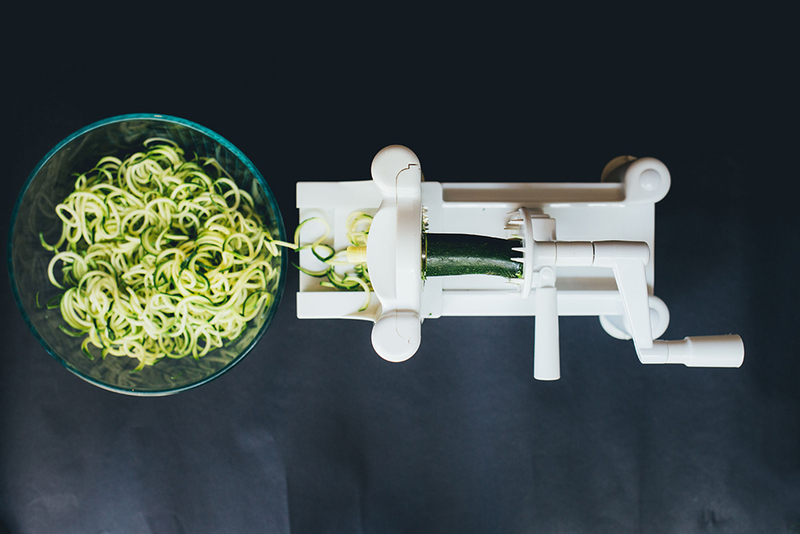 Wash zucchinis and use spiralizer to get your zoodle noodles. 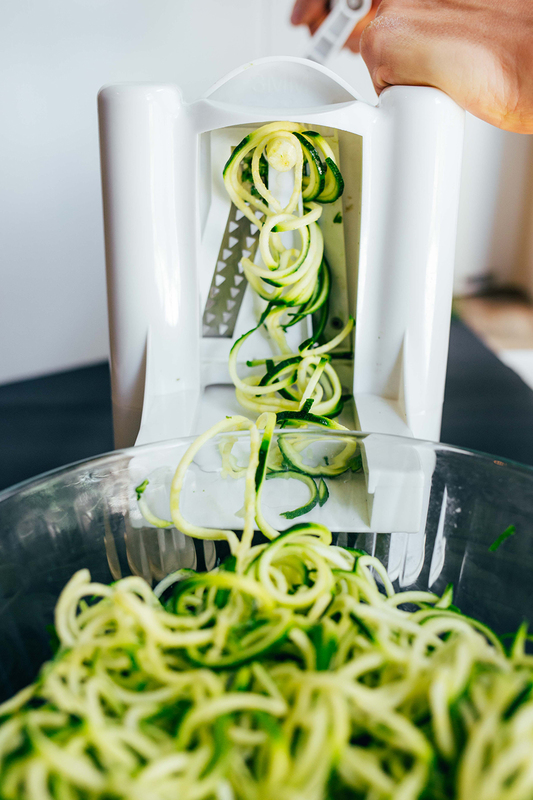 Follow instructions for your spiralizer, there are many types with different instructions. Check out my below photos for a better shot of how mine works. Open jar of marinara sauce, add TMW crumbles and heat until warm. Add in dice tomatoes/basil and stir. 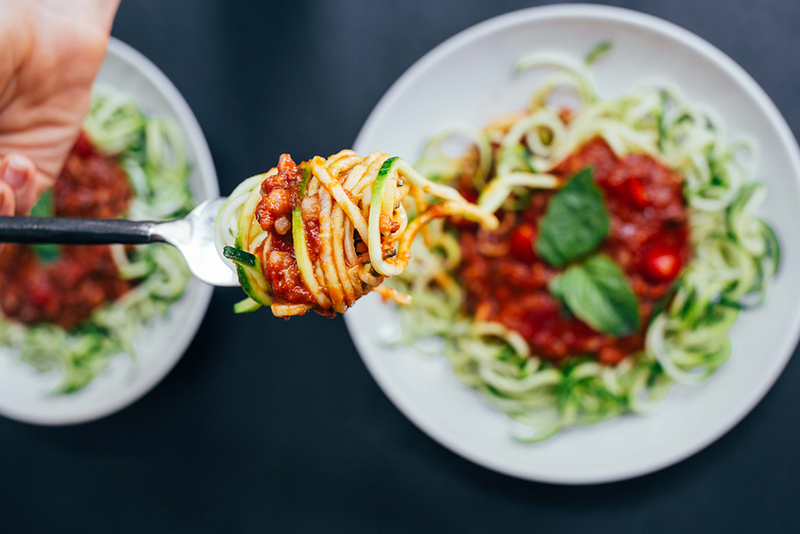 Plate zoodles and top with sauce. 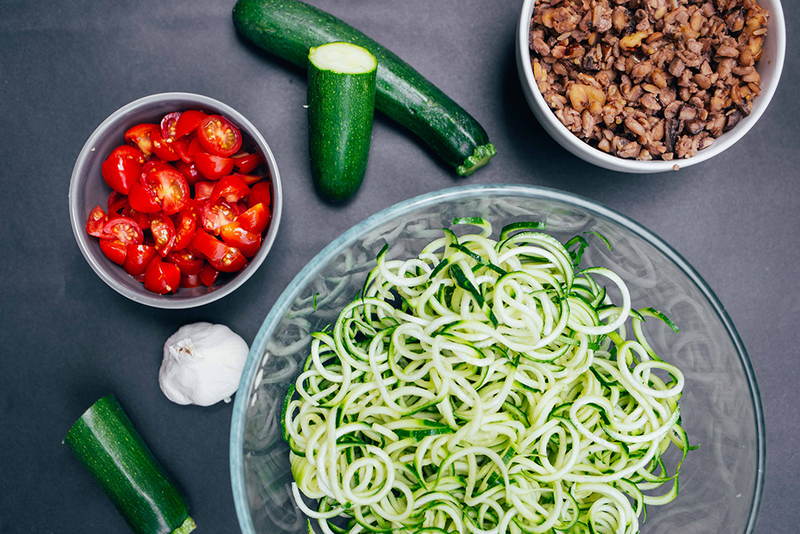 You can blanch zoodles before serving if you'd like! Please see intro paragraph or below link for my TMW (Tempeh Walnut Mushroom) Crumble recipe. Just incase you missed the TMW Crumbles recipe above, here it is! 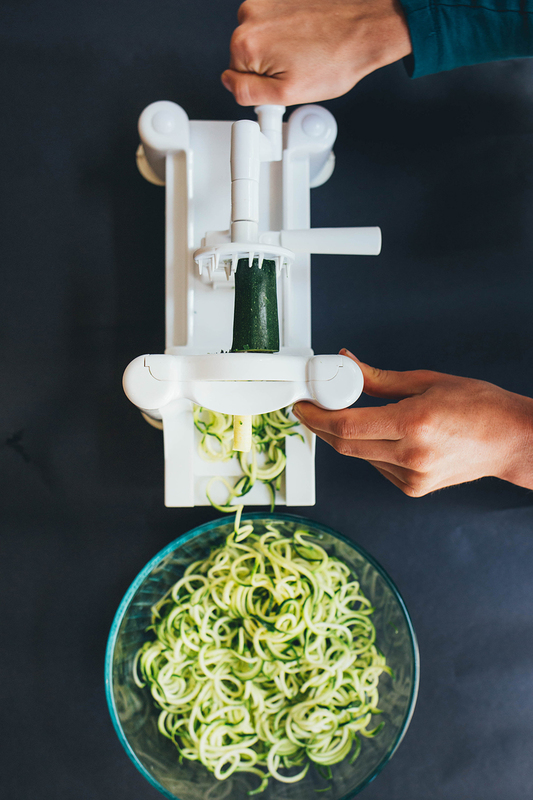 And if you’re interested in getting the spiralizer I use- I love it! 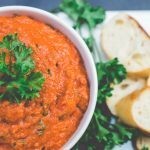 Special thanks to @Meowmeix of the Running Wild Blog for the recipe help meal prep tips. If anyone is inspired by my RAW foods talk– my good friend and brilliant nutritionista, Monica Parodi, designed an awesome 5 Day Raw Detox. 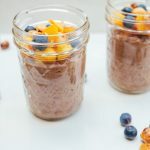 She teamed up with RAW food guru Matthew Kenney. They are a gorgeous duo. Check out their detox here. 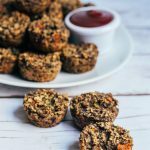 Want free recipes like this in your inbox? Subscribe to our weekly newsletter.